1. A bedside pocket for storing common nightstand clutter (mainly so you don't have to keep getting out of bed to get the important stuff). Get it from Amazon for $14.03. 2. 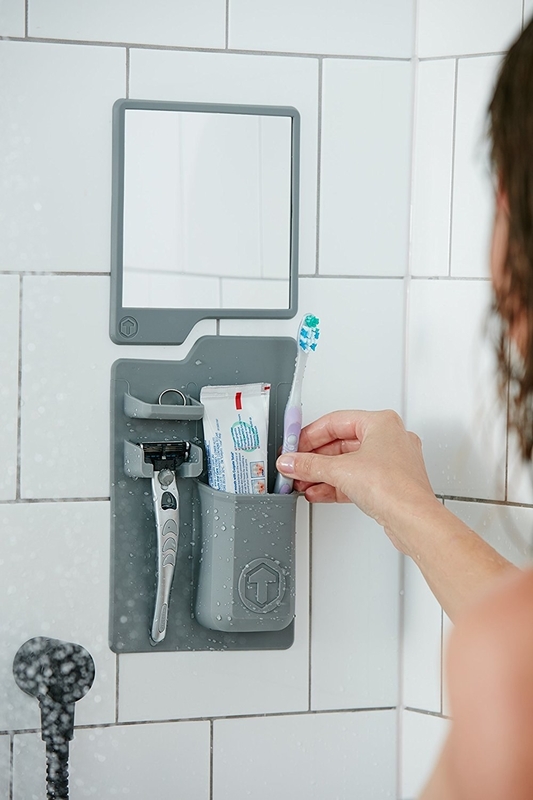 A toiletry holder that'll grip to shiny surfaces in your bathroom for easy access to your essentials in the shower or above the sink. Promising review: "I had been looking for a good shower caddy for awhile now. This one is great! we have a shower unit and it adheres to the fiberglass shower walls like a champ. NO adhesive or sticky mess to worry about. We keep our tooth brushes, toothpaste, and razors in it. The surface area of the caddy does a good job of sticking to the wall even when it is loaded down with all of our stuff. We haven't seen just how much weight it can handle, but we didn't buy it for holding a large bottle of shampoo or body wash, so yeah. Other than that, it is perfect!" —Caleb P.
Get it from Amazon for $14.72+ (available in four colors). 3. 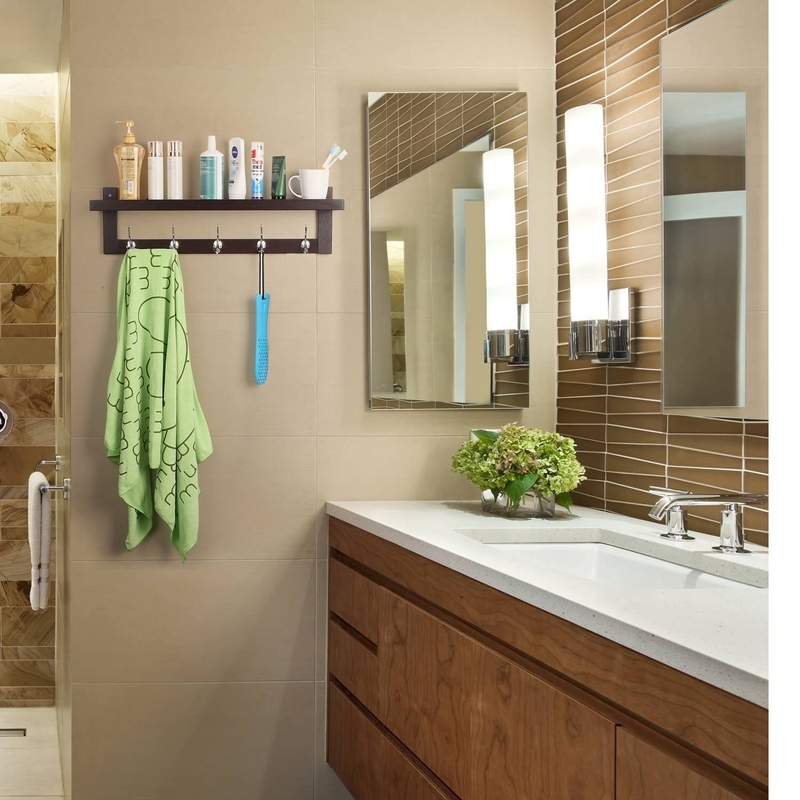 A chic storage mirror with built-in shelves so you can stylishly store toiletries and other bathroom products. Get it from Urban Outfitters for $99. 4. 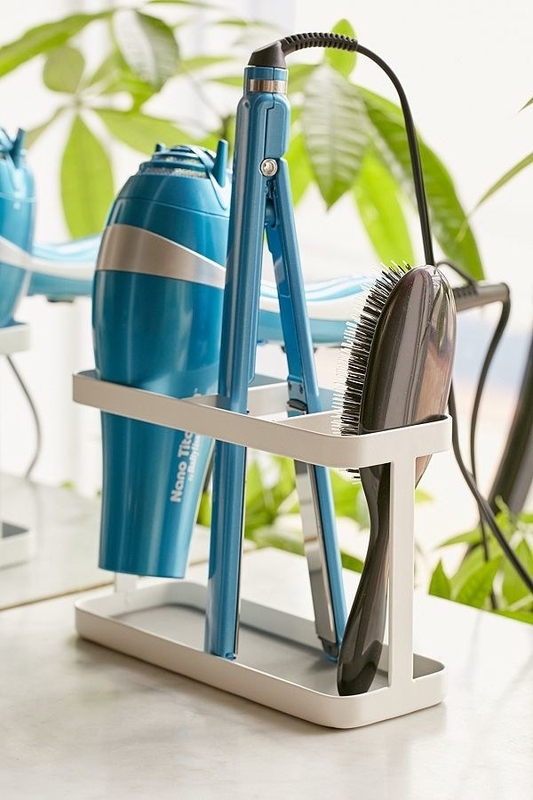 A hairstyling tool organizer to give your curling iron, hair straightener, and dryer an actual home. 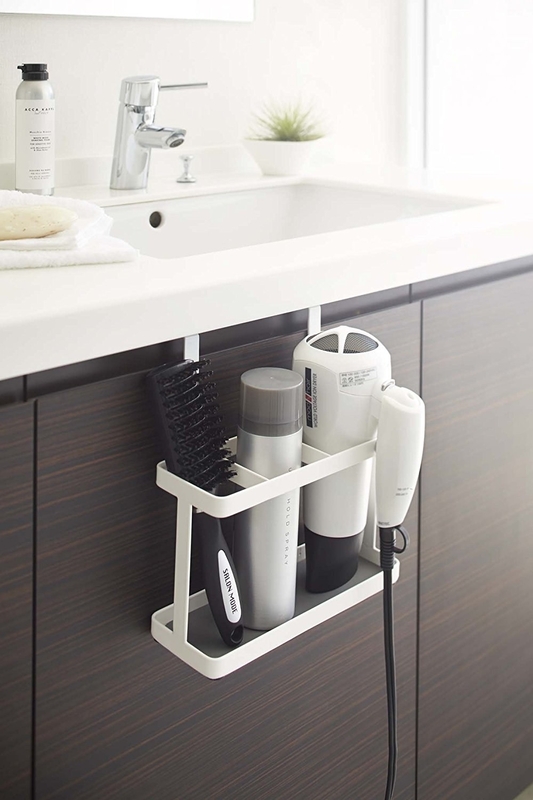 It comes with hooks so it can be hung on the cabinet or left out on your vanity as is! The hooks can also be used to wrap the cords from your heating tools so you can finally say g'bye to the tangled mess under your sink. 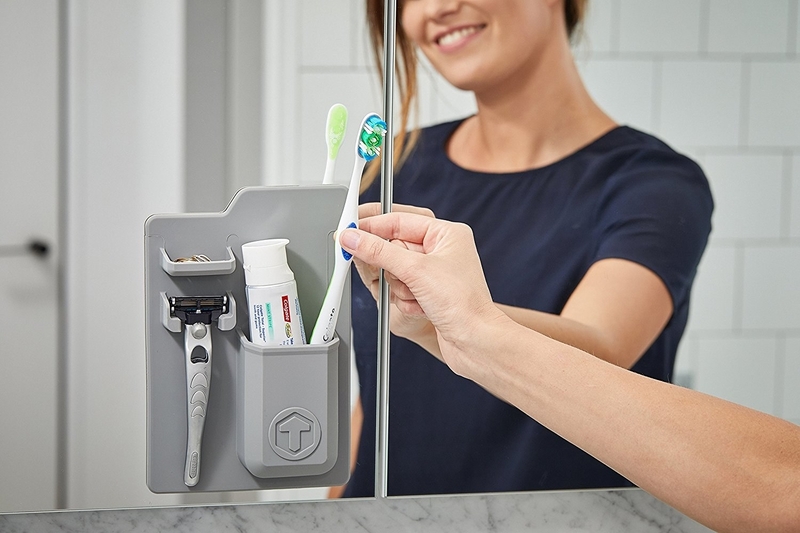 Get it from Amazon or Wayfair (available in two colors) or Walmart (available in white) for $25.99+, or from Urban Outfitters for $44 (available in silver). 5. A hanging cocktail bar because *you* deserve to have a fancy drink station. It's also the perfect solution if you don't have space for a giant bar cart. Get it from UncommonGoods for $110. 6. A bottle loft that'll give your fridge some extra space and also just make you look cool as hell. 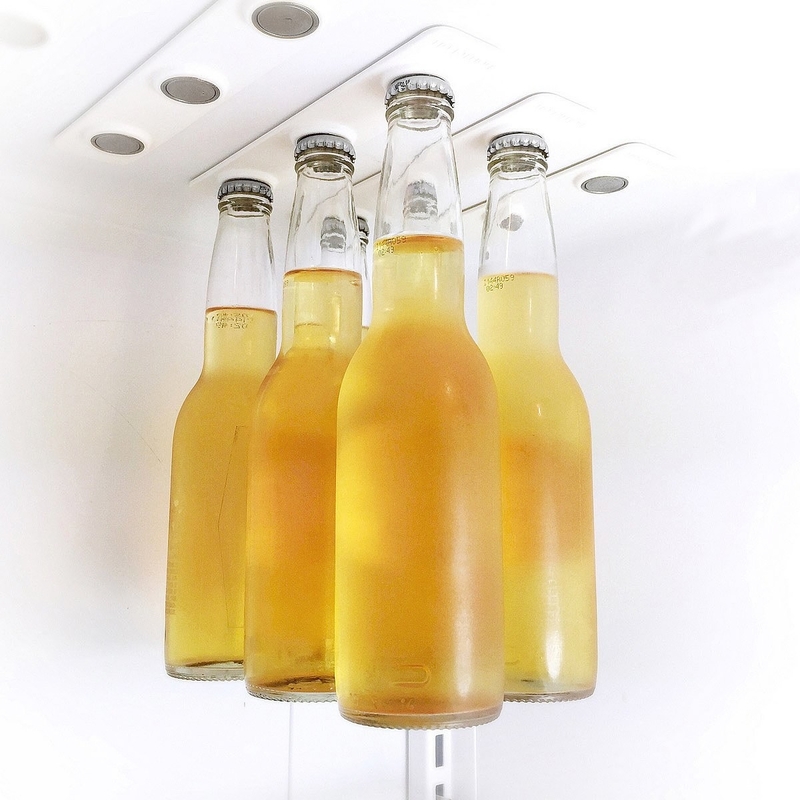 Bottles are able to hang from the ceiling of your refrigerator with these adhesive magnetic strips. The magnets are super freakin' strong, so you don't have to worry about the bottle's weight detaching from the strip! Get two strips from Amazon for $29.99. 7. A trendy stoneware utensil holder with a convenient notch for displaying your tablet so you can *thrive* in your kitchen (and not worry about spilling food all over your iPad). Get it from UncommonGoods for $60. 8. A modular purse organizer because let's be honest here, who the heck knows what to do with all of their handbags?! Well I do now, thanks to this ~handy~ thing. The adjustable panels let you create cubby holes that are the perfect fit for any combination of your bags. Some reviewers mentioned the instructions can be a little confusing, but once together, it's solid and sturdy! Yay, I can finally stop stuffing my purses under my bed. Get it from Target for $48.49 or Walmart for $43.99, or from Bed Bath & Beyond for $54.99. 9. A wall-mounted hook shelf you can use in the entryway to keep coats and keys, or in the bathroom for towels and toiletries. Add a lil' succulent to the top and it will be functional *and* decorative. Get it from Amazon for $32.99 (available in two colors). 10. 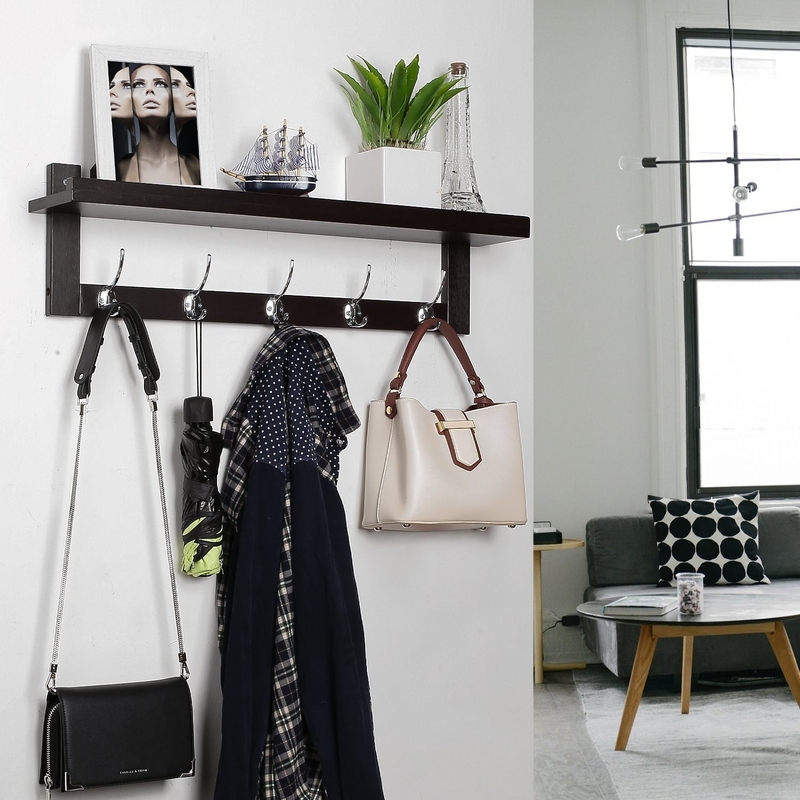 A space-saving hanger pack that'll let you neatly store pants or scarves in your overflowing closet. Get it from Amazon for $8.97+. 11. 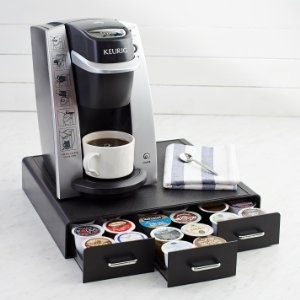 A sleek coffee drawer to hold all your K-Cup pods (up to 36 of 'em! ), creamers, and sugars so everything you need on a groggy morning is within arms reach. 12. 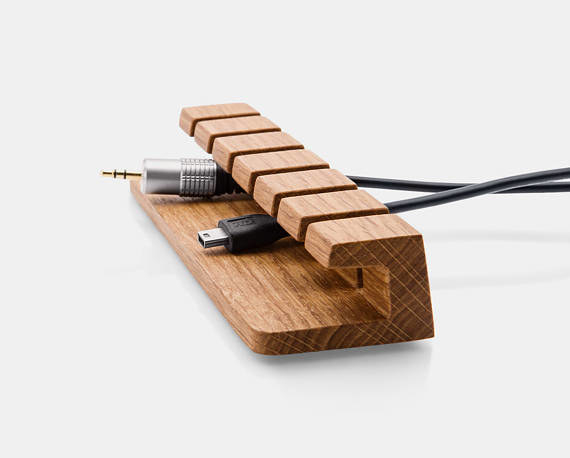 A wood organizer that'll transform your cluttered desk into a trendy space you won't mind working at all day. Get it from DryanCollections on Etsy for $29.99+ (available in three colors). 13. 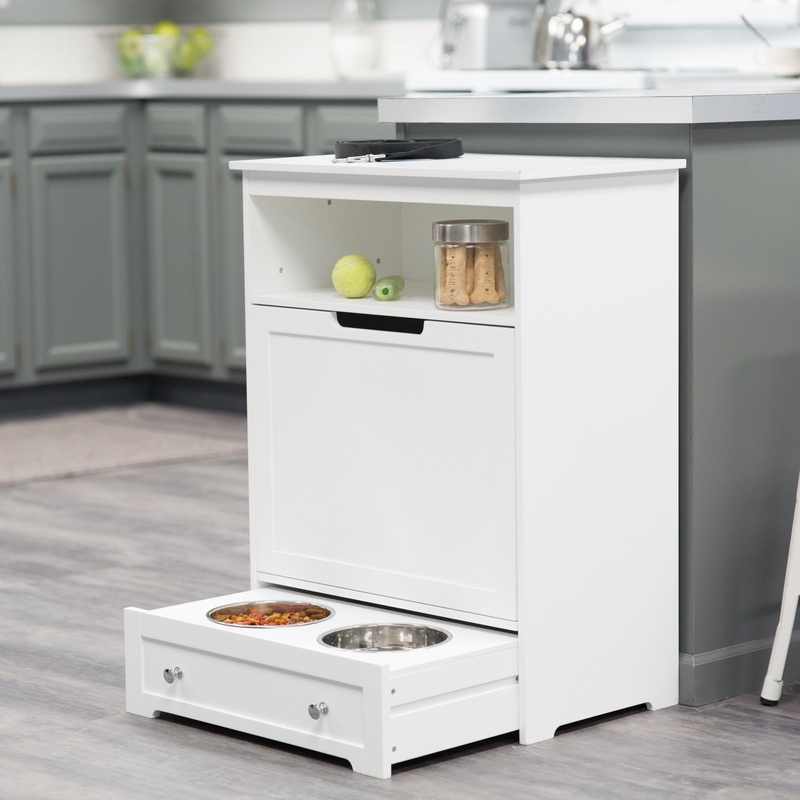 A pet feeder station for storing all of your pets essentials — food, bowls, leashes, toys — in one place. 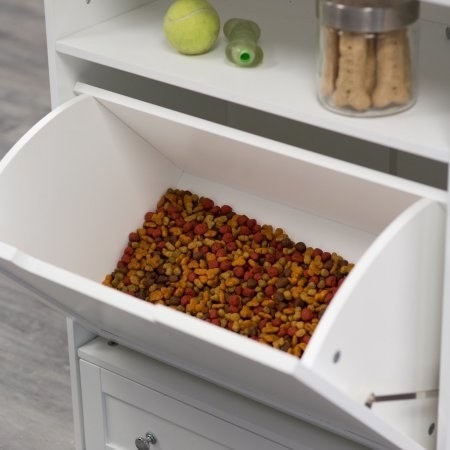 The food tray can slide in when your fur child is done eating so it's easy to tidy up and save space. Get it from Walmart, Hayneedle, or Jet for $159.99. 14. A storage shelf with hooks for hanging your favorite mugs so all your guests can appreciate your impeccable taste in coffee cups. 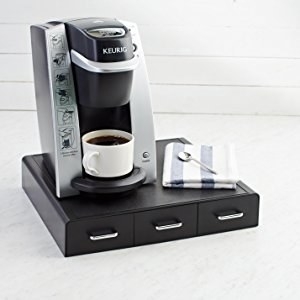 Get it from Wayfair for $41.99 (available in three colors). 15. A driftwood jewelry hanger because it's possible to use your necklaces, bracelets, and earrings to make some cute AF home decor. Get it from Curiographer on Etsy for $24.95+ (available in 15 style and size combinations). 16. Or for a more practical storage option, a hanging jewelry organizer with 32 pockets and 18 loop closures so you always know where every piece you own is. Keep in mind the hanger does not come with this product, but has a small hole at the top for you to use your own. And it's not limited to just jewelry! One reviewer said she used this to store and color code all of her nail polish, and another stored all of her kids' hair accessories in the pockets. 17. A bath cabinet that'll fit right over your toilet so you have more storage space and a little extra pizzazz in your bathroom. Get it from Amazon for $59.15. 18. A freestanding closet to solve all your small closet woes. The shelves give you the space to store linens and purses, while the DOUBLE garment rods let you hang your favorite coats and shirts. Promising review: "Great product! Assembly was very simple and I had absolutely no problem getting this unit together by myself. It is very sturdy and can hold a good amount of clothes. 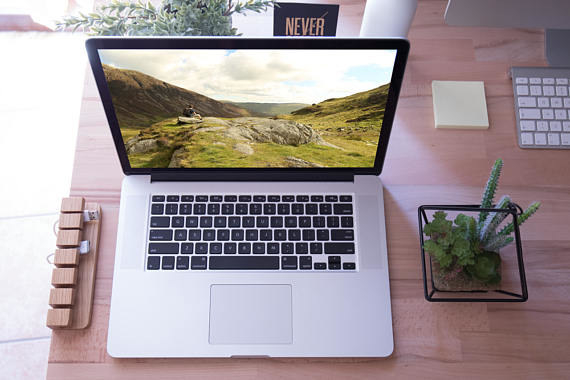 I would recommend it for someone looking for a simple and practical storage solution." —Marlene Z. 19. And a pack of fabric basket cubes for your freestanding closet that you can use to style up the organizational unit. Get it from Amazon for $20.99+ (available in two colors). 20. A cable organizer that'll keep your cords from ending up in a tangled mess and prevent your charger from tragically slipping behind your desk. Get it from Batelier on Etsy for $29, or something similar from Amazon for $9.99. 21. An over-the-door shoe organizer to give all your favorite pairs (up to 36!) the TLC they deserve. Plus, the adjustable shelves allow you to hang taller shoes, like boots, so you never have to scrunch them up to fit! Get it from Amazon for $18.99 (available in two sizes). 22. A three-tier corner shelf because it's time to stop balancing a heavy stack of plates and bowls in your hands to try to get to the one that's on the bottom. It also just saves a ton of a space, so it's a win win! Pro tip: One reviewer used this to stack leftover meals in the fridge to save space! 23. A cabinet door hanger you can use to put cutting boards, plastic bags, cleaning bottles — you know, all the miscellaneous things that take up too much real estate. 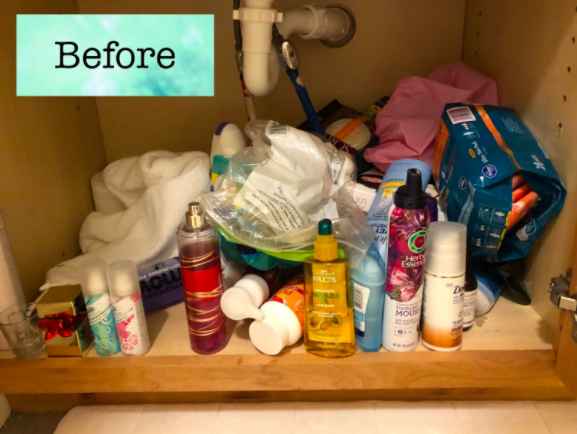 Or put it the bathroom to hold extra bottles of shampoo and body wash! 24. 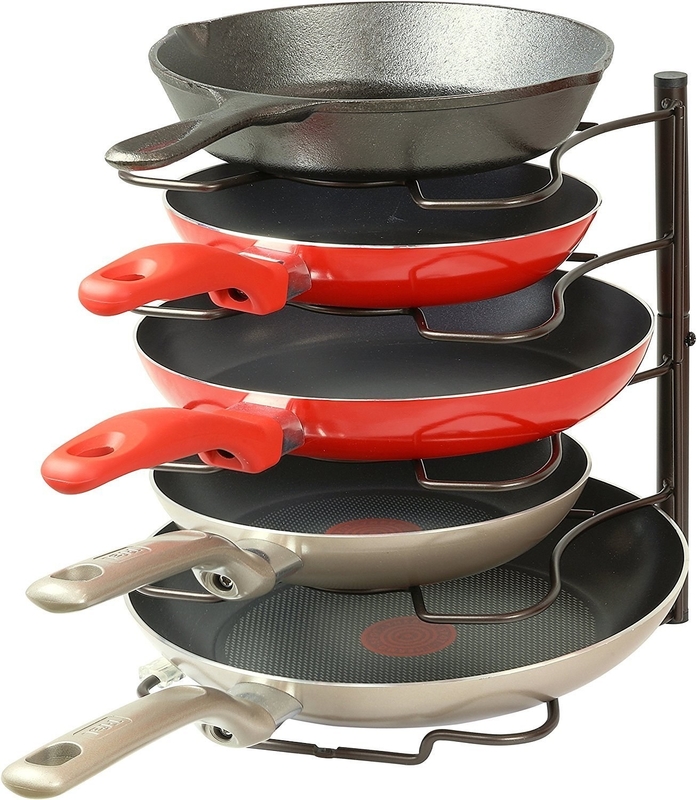 A pan and pot lid stand for keeping your cookware nice and tidy. 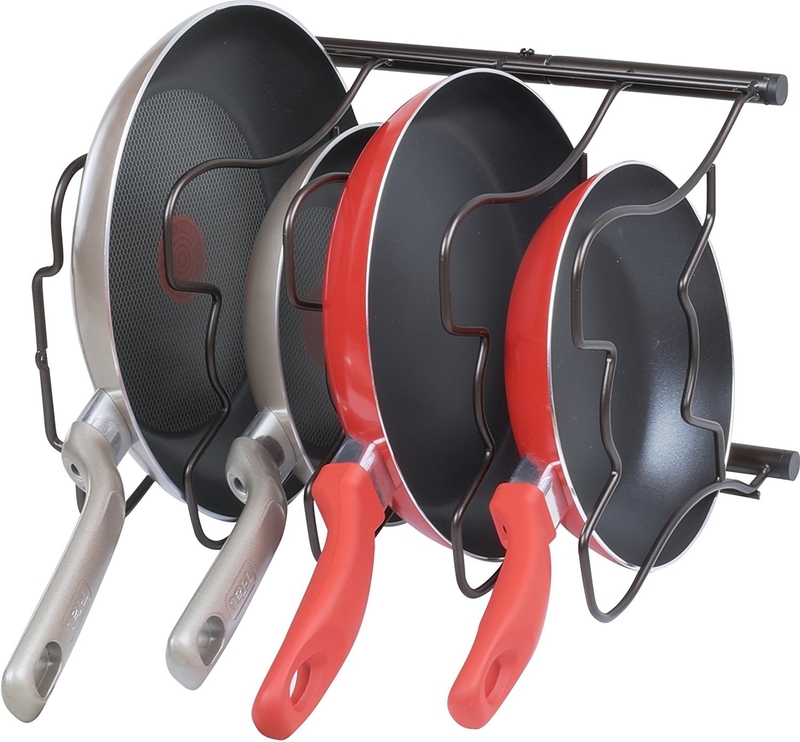 It also prevents nasty scratching that comes with stacking pans on top of each other. It can be used upright or on its side; whatever is ideal for your space! Get it from Amazon for $14.97+ (available in two colors). 25. A can rack that'll give you so much extra room, you'll want to extreme coupon just so you can completely utilize all the leftover space. These stands are stackable so you have the option of purchasing two and easily attaching to each other so you have one giant can organizer. Get it from Amazon for $20.87. 26. A stackable drawer and shelf to get super organized. Use it in your cabinet for pantry items, or under your bathroom sink for cleaners and toiletries. Use it for random kitchen items that you have no idea what to do with. Basically, use it if you just really need to eliminate the clutter. Get it from Amazon for $25.87 (available in two colors). 27. A rotating makeup holder with adjustable shelves so you can customize your organizer to perfectly fit your products. The removable trays also make it super easy to take apart and clean! Promising review: "I needed something for foundation and skincare bottles, and this is perfect. 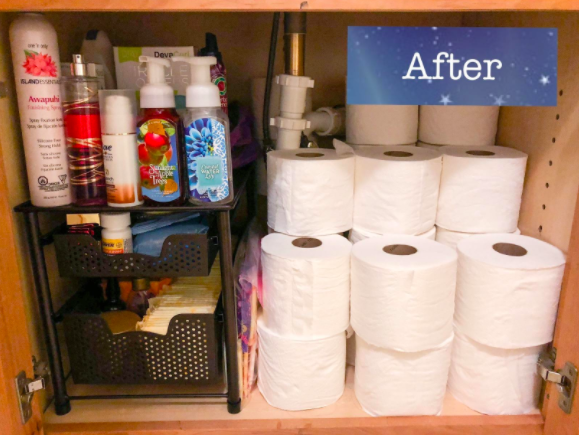 The center tier shelves are adjustable in quarters — there are four little shelves that can be placed anywhere along the center of the unit, so you can adjust to accommodate taller bottles. Then the top tier has some slots in the center for lipsticks or tubes, and the perimeter is perfect for nail polish bottles. I easily got 14 foundations, 5 to 6 skin care products (serums and 1 to 2 ounce bottles of sunscreens), an 8 ounce bottle of toner, and maybe 12 nail polishes into this unit with lots of room to spare. Best part: The little slots on the top are pretty generously sized and it's the only place I can get my stick foundations to fit." —A.S. Get it from Amazon $19.99+ (available in three color and size combinations). 28. A kitchen caddy because the sink is a filthy place and your sponges and brushes deserve 👏 better 👏 than 👏 that. 29. A six-piece set of stackable bins perfect for decluttering a messy fridge. Yes — you *can* keep your refrigerator tidy and keep it from mysteriously swallowing products only to find them years later. You might just save money on groceries because you'll actually know where things are! Get it from Amazon for $28.89. 30. A bamboo tea organizer you'll appreciate if you just really love tea and have way too many boxes in your cupboards taking up precious space. Now you can stylishly display them and revel in being the true tea snob* that you are. *Tea snob = Knower of all the things tea related. The highest of compliments. Get it from Amazon for $45.99.